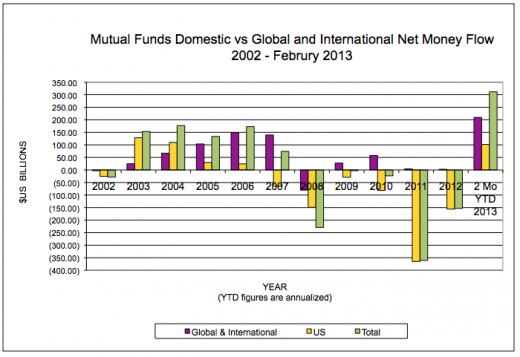 Mutual funds are probably overwhelmingly retail investor dominated, and are the principle 401-k vehicle. They still have many times more assets than ETFs. The chart shows reversal from adding assets from the stock market bottom in 2003 through 2007 to wholesale exit in 2008. In 2009 and 2010, there was a mixed bag of comparatively minor net asset growth and shrinkage. In 2011 and 2012, investors were once again exiting equities, but at an even faster rate than during the crash of 2008. However, 2013 in the first two months shows a huge turnabout, with larger inflows to US funds than all years except 2003 and 2004 at the beginning of the last bull phase. Levels of investment in non-US or global funds recently are at levels we have not seen in the past 13 years. Interestingly, even though US stocks are outperforming the rest of the world, retail investors are putting over twice as much net new money into non-US or global funds as into US equity funds; while at the same time US stocks are rising and most other stocks are falling. Are retail investors misinformed? Or, are they seeking to buy international markets when they are down in a “buy-low, sell-high” effort? This entry was posted on Saturday, April 20th, 2013 at 11:52 PM and is filed under Analysis, Data. You can follow any responses to this entry through the RSS 2.0 feed. Both comments and pings are currently closed.